When past meets present: the ancient Mesopotamian Empire of Assyria was, and still is an incredible source of cultural and archaeological wealth. In particular the city of Nineveh, once the biggest city in the world, continues to appeal to many (art) history fanatics. This rich heritage, however, is now being threatened by the violence and destructions by the Islamic State (IS). 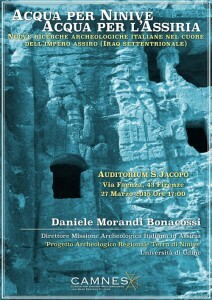 This Friday, April 27, CAMNES (Center for Ancient Mediterranean and Near Eastern Studies) organizes Water for Nineveh – Water for Assyria, a conference during which Prof. Daniele Morandi Bonacossi will present the results of the Regional Archaeological Project “Terra di Ninive”, a large interdisciplinary research lead by the “Italian Archaeological Mission in Assyria” of the University of Udine. The project aims to study the archaeological landscape of the Dohuk region (current Iraqi Kurdistan) and to document, protect and promote the extraordinary cultural heritage of this region situated in the immediate hinterland of Nineveh, the ancient capital of the Assyrian Empire (current city of Mosul). The conference will be held in the Italian language and is open to the public.